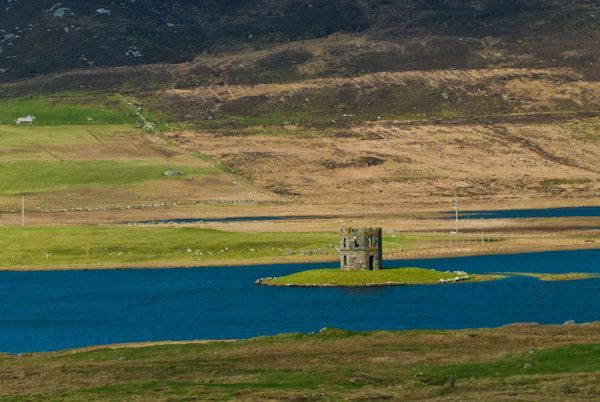 This castellated folly was built on an island in a small loch by Dr Alexander MacLeod of Balelone (see Kilphedder Cross). 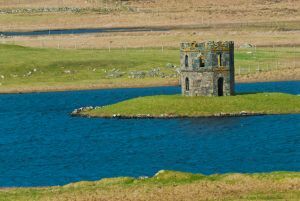 But don't be fooled by the Victorian appearance; the tower was built with stone scavenged from an earlier Iron Age dun. So you could stretch a point and call Scolpaig a dun, but that would give the wrong impression of the site. 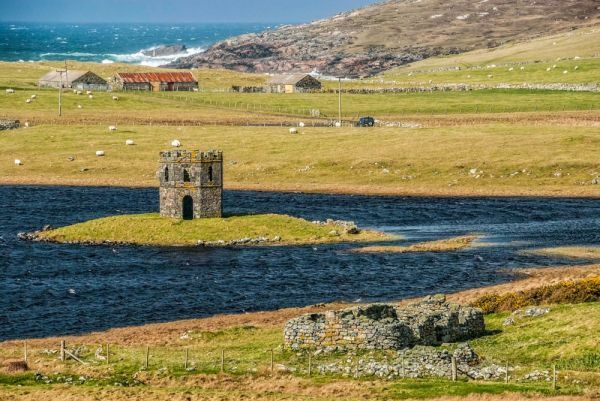 Around 1820 Dr MacLeod, for reasons best known to himself, decided to pull down the Iron Age remains and create a mock medieval tower in its place. One rather kind interpretation is that the doctor was concerned about the living conditions of the islanders and came up with his folly building plan as a make-work project to provide employment. Whatever the reason, the tower is certainly eye-catching as you drive along the west coastal road. You can cross to the island if the water level is low and you have a good pair of rubber boots, but the folly is a shell, with the interior inhabited only by birds. Location: Immediately west of the A865, north west corner of Norh Uist. Access to the lochan across farm fields, but good views from the road. 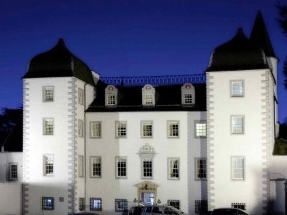 Nearby accommodation is calculated 'as the crow flies' from Scolpaig Tower. 'Nearest' may involve a long drive up and down glens or, if you are near the coast, may include a ferry ride! Please check the property map to make sure the location is right for you.